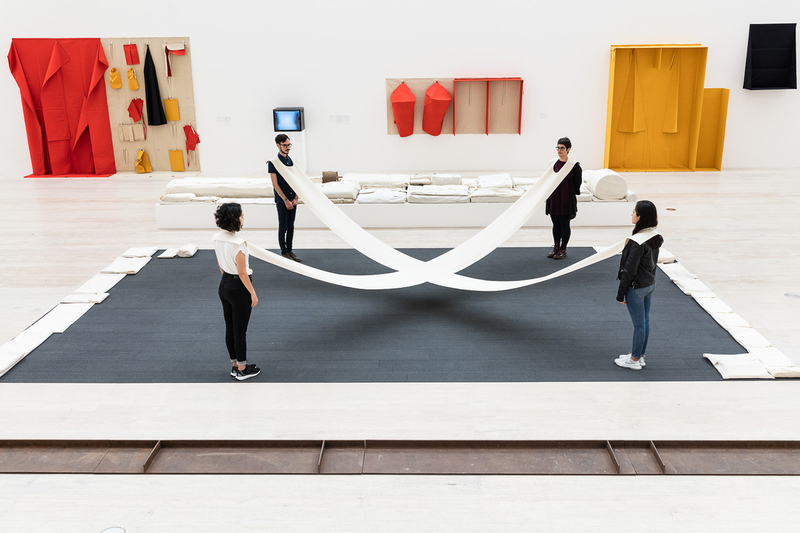 Conceived and curated independently, these two parallel exhibitions—Franz Erhard Walther’s first in the Mexican and Latin American context—beautifully complement each other. One takes over the top floor of the David Chipperfield–designed Museo Jumex in the industrial district of Nuevo Polanco; the other is staged amid the clutter of Casa Luis Barragán, the final residence and studio of the revered Mexican architect, situated in the working-class Tacubaya neighborhood of Mexico City. Their respective settings result in two contrasting shows, despite the occasional overlaps, which, if anything, throw into relief what makes the shows different. With its skylights, the lofty third-floor gallery of Museo Jumex is hardly a white cube: the museum’s distinctive sawtooth roof translates inside the building into a series of trapezoidal nooks that call for inventive display strategies. But in Objects, to use / Instruments for processes, these potentially dead spaces are animated by Walther’s Trial Sewn Pieces (since 1969) of disparate shapes and sizes, carefully arranged to form constellations of colorful fabric objects. Likewise, the height of the ceiling lends itself superbly to showcasing the more compact Wall configurations series, whose rectangular component parts recall the layout of newspaper columns, mounted high on one side of a wall that carves up the gallery space into two communicating areas. Whereas the more confined of the two spaces, and the first that visitors access, contains series of mostly framed delicate works on paper in a range of media, the main space is dedicated to starker fabric sculptures, presented as floor and wall pieces. Indeed, the cloth pieces neatly folded and laid out on the gallery floor in their dormant state (“storage form”) only assume their three-dimensional sculptural guise once they are unfolded and brought to life by pairs and small groups of visitors (“action form”), who are instructed by dedicated staff how to don them and tease them out. The stylized black-and-white landscape photographs documenting early outings of these works—actions performed for camera alone—do not begin to convey their tactile and physical quality, the feel and pull of the taut fabric, the playful yet strenuous nature of the exercise, the intimacy of what is more often than not a shared experience, binding one body to another or others. The two shows have in common iconic pieces from the First Work Set, such as Channel of Sight, Body Weights, and Positions; invigilators sporting the hot pink-orange Halved Vests (2016), whose vivid hue and daring asymmetrical design are a comment on the drab uniforms typically worn by museum staff; the looped black-and-white video Determinations of Proportion I and II (1962/1972), which gives the exhibition at Casa Barragán its title; and the steel sculptures that double as platforms for visitors to walk sideways on, thus becoming part of the piece. Whereas Walking Path (1973) is installed on its own in the walled garden of Barragán, its twin counterparts at Museo Jumex are facing each other (and potentially other living sculptures) in the middle of the third-floor gallery. Displayed around the house and in the architect’s studio—a exhibition within an exhibition showcasing the artist’s drawings of plans for past shows—Walther’s works are, by and large, a discreet presence at Casa Luis Barragán. They blend in with the decor to the point of being at times hard to spot. Rather than serial works, which dominate the Museo Jumex exhibition, they tend to be singular small-scale sculptural objects, responding to the idiosyncratic features and the baroque sensibility of the place. Take the coiled rope of Space (1963), which, placed atop the breakfast table, strikes an ominous note, or the reddish-brown Forehead Piece (1963), consisting of five small, velvety squares sewn together and mounted on the wall in Barragán’s bedroom beside an Annunciation painting, whose dark tones it speaks to. Designed to be held in one’s hands, worn on one’s head like a cap, or staked out with one’s feet, the pieces brought together at Casa Barragán call for a more sensual engagement in keeping with their domestic surroundings.